Quiet and cool 2-bedroom apartment within the central area. The apartment features a living room 20 пїЅ², two bedrooms of 12 пїЅ² & 14 пїЅ², a hall 18 пїЅ², a kitchen 10 пїЅ², and a bathroom with the shower cabin. It is located on the ground floor. The entrance to the apartment block is from the yard through a coded gate. Parking is available on the street and in the yard. A guarded parking is located 7 minutes walk near the Big Concert Hall "Octyabrsky". The apartment sleeps up to 2+2+2+2 guests (two queen size beds in the bedrooms, a folding queen size bed and a double sofa-bed in the living room). An extra speeping place is available in the hall. Amenities include TV sets in each room, a refrigerator with a freezer, a stove, a microwave oven, electric tea kettle, kitchen utensils, and a washing machine. The apartment has linens, towels, bath amenities and cleaning supplies. 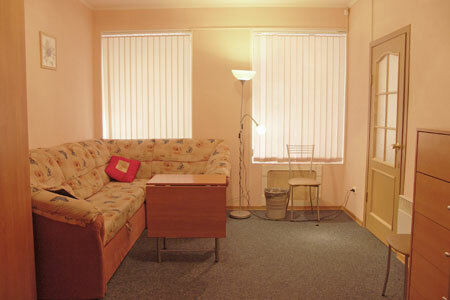 Conveniently located within the working distance to Nevsky Prospect and Moskovsky railway station. The nearest metro station "Ploschad Vosstaniya" is within 20-minute walk. Close to the Big Concert Hall "Octyabrsky".